The Los Angeles County Fire Department and Los Angeles County Firefighters Local 1014 are saddened to announce the passing of one of their own in the line of duty. Firefighter Russell Fagan passed away on November 24, 2018 from job-related cancer. He was 56 years old. 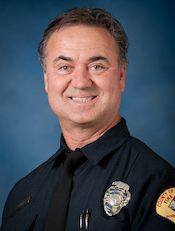 Brother Fagan worked faithfully L.A. County for about a quarter century, most recently at Fire Station 123, Battalion 22. More than half of his career was spent working in the department’s hazardous materials unit. Brother Fagan is survived by his wife Jennifer, son Seth and daughter Hannah. Memorial Service: Celebration of life services for Brother Fagan will be held Wednesday, December 12, 2018 at 11:00 A.M. at Grace Baptist Church, 22833 Copper Hill Dr., Santa Clarita, CA 91350. .
Remembrances: Cards, letters and flowers can be sent to: Mrs. Jennifer Fagan, 27829 Parkvale Dr., Saugus, CA 91350.